Enjoy the unmistakable aroma of juicy lime – with an intense effect. Feel the sweetness and acid in perfect combination with notes of lemon and rivet lime zest. OK, I, Moe Unz, am getting a little concerned with these product descriptions. The aroma has an "intense effect"? Are you supposed to stick the portion pouch up your nose? 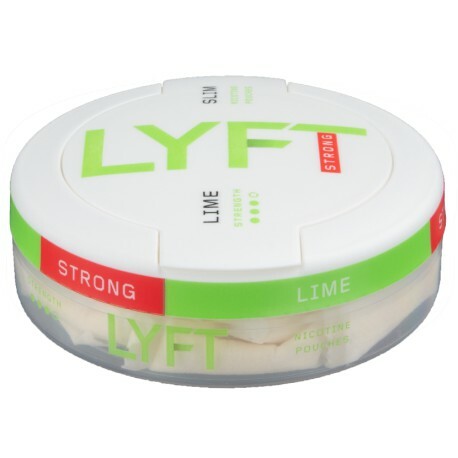 My friend Larry has used LYFT Strong Lime and says it is tasty but for use under the upper lip only. He described the flavor as the same as the EPOK version, but like all the LYFT products, has a slight burn sadly missing in EPOK. I asked him to try putting one in his nose to test out the "intense effect" but he declined. He said the strong nicotine under the lip was fine for him. Give us your thoughts in the Review section below. NOTE: We do NOT advocate placing a portion in your nose!